This website is always under construction so visit often and watch for our new foals!! We are a small breeding/training facility located in PA. We train and breed Paints, Arabians and Half Arabians for performance. We are interested in producing foals with good conformation and great minds. We always have horses for sale. Check them out!!! Standing at stud: "THE MOONLIGHTER"
Good bone and a nice mover!! Outstanding pedigree. Bloodlines include: Skipper W (4x) King, Impressive, Leo, Wimpy, Weiscamp. "Lighter" is consistantly producing pretty headed, good sized paint foals with great color. 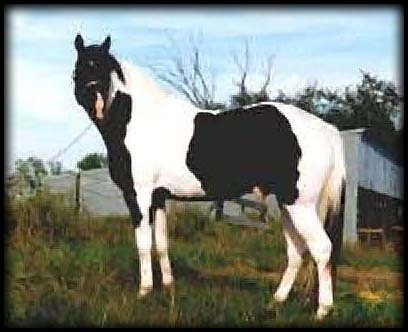 He has sired over 50% Black and Whites. He has produced Buckskin and Blue Roan too!! This website created and maintained by Barb Pattison (e-mail to katluvr@telusplanet.net).